Bolgheri, on the Tuscan coast just south of Livorno, is one of Italy’s most prestigious vineyard areas. 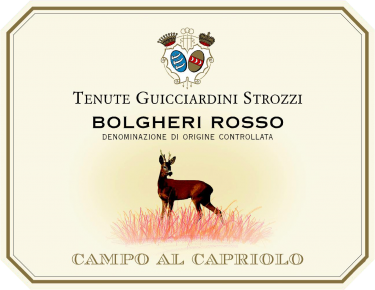 Campo al Capriolo (which translates to ‘the Deer Field’) is a classic Bordeaux-style blend of 40% Cabernet Sauvignon, 40% merlot, 20% Syrah aged for 12 month in French oak barriques. Deep ruby red with an intense bouquet of small black fruits and spices. Full bodied with smooth, silky tannins that lead to an elegant finish. This hearty red is the perfect partner for variety of dishes, especially meat such as roasted pork, game or a juicy steak Florentine. Note: This product is being discontinued by the winery. 2015 is the last vintage available after which is it being replaced by Bolgheri Ocra 2016 (rated 92 JS, 93 WRO). Aged for 12 months in French oak barriques (50% new and 50% used).